Jill and Jacinto Anguaya, owners of Quichua World Market, are closing shop. 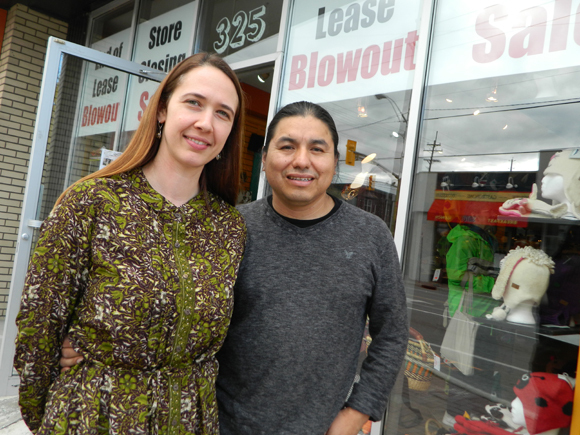 Husband and wife team Jill and Jacinto Anguaya are saying goodbye to a Kitchissippi community that has supported their business for the last five years. The Westboro couple, who own Quichua World Market at the corner of Richmond Road and Churchill Avenue, will be closing their local shop on December 31. The couple expanded their business from the downtown core to Westboro, and was welcomed into the neighbourhood during the community’s annual Westfest event five years ago. For more than 20 years, they have worked at locations across Ottawa selling Canadian and internationally made clothing, jewellery and gifts. The Westboro location’s closure comes just over a year after the building’s landlord, Doug Herbst, passed away from cancer. Herbst’s family owned Westboro Sports Centre next door to Quichua World Market, which also closed its doors. Following Herbst’s passing, the building that houses Quichua World Market was purchased by Toronto development company Main and Main. The developer also owns a property close to the Real Canadian Superstore where they have plans to build a condominium. “We found out that the people who bought are Toronto developers and down the line, this will be redeveloped,” says Jill, adding that the building is slated for demolition but isn’t sure when. The company offered to let them continue renting on a month-to-month basis in the new year, but the couple decided to close up their Westboro location at the end of December. The Anguaya family owns and operates two other stores in Ottawa which will remain open. Quichua’s Kameleon PopShop on Sparks Street sells women’s clothing, gifts and accessories, and Tickled Pink in the ByWard Market sells Canadian-made children’s clothing, costumes and toys. But the owners say they will miss the regular customers they often saw in Westboro. The couple decided not to relocate their Westboro store, and will focus on their two other downtown businesses. The stores will continue to carry some of the product lines found in Westboro, and they have been developing a website where they will sell their Kameleon jewellery online. The business owners would love to return to the Westboro community someday.